You are browsing the archive for fay. 2012 was a landmark year for quizzing in Ireland. In June the first-ever Irish heat of the World Quizzing Championship took place in Athlone and, on that same day, the Irish Quiz Organisation was founded. At the very end of the year though, all of us involved in international quizzing were shocked by the sudden death of the man who was elected Chairperson of the IQO that day, David Fay. 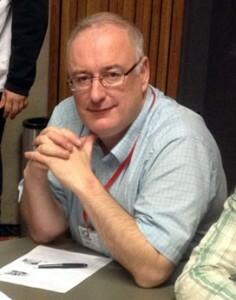 David, a blue-and-blue Dubliner, was involved in quizzing his entire life, both hosting and taking part. He wrote the questions for a regular quiz night in a bar in his native Cabra for over 11 years. He also competed in quizzes at the highest level, as far back as the national quizzes hosted in the 1980s by the late Peter Murphy. He was also the man who ignited my own interest in international quizzing. In October 2010, I happened to turn on my radio on a weekday afternoon, tuning in to the Sean Moncrieff show. At that exact moment, David was his guest – he was trying to put together an Irish team to take part in the 2010 European Quizzing Championship. He knew he was good enough but he needed some team-mates to join him. Desperation had led him to taking to the airwaves. He even gave out his personal phone number for interested quizzers to contact him on. I called the number. Alas, it was all a bit short-notice for me, as the EQC was taking place the following week. In fact, David ended up having to go to Derby (that year’s venue) on his own. It didn’t disuade him though and, while there, he showed that Ireland did have elite quizzers.